Device provisioning isn’t very exciting, but it’s one of those things you have to do as an internet service provider. You have to make sure CPE like cable modems, DSL modems, and even fiber devices are authenticated and come online. It’s the first thing that takes place when someone connects to your service. It also seems like acronym soup. RADIUS, DHCP, PPPoE. We understand these acronyms and how to make them work, so let us worry about TNASI (the next acronym someone invents). provisioning the customer premise equipment for you. If you are managing a fiber broadband network and want to provision your ONT devices as if they are a DOCSIS device, we also support DPoG and DPoE. What about provisioning for IPv6 and DHCPv6? Those can be awfully scary if you’re doing provisioning on your own. Are you using an open source solution? They don’t always do a good job of addressing IPv6. Maybe you’ve looked at commercial solutions that do, but those come with some high up-front costs. Our advanced broadband provisioning is a commercial-grade system that supports IPv6 Prefix Delegation, DHCPv6 Reconfigure, Temporary Address Allocation, CableLabs DHCP Options Registry and DDNS AAAA updates. Best of all, our Advanced Provisioning is a hosted solution that’s fully managed, monitored and supported. We host the provisioning services centrally in our data center. What? You’d prefer to host the servers on your network? Okay. But we’ll still manage it for you. 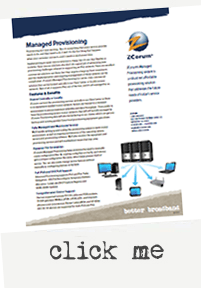 No reason for you to deal with server management, software updates and all those acronyms. By the way, we also provision email accounts, and we have the ability to send provisioning calls to different servers. If your billing system can only send provisioning requests to one place, send it to us, and we’ll take it from there. Drowning in integration protocols? That’s okay. We speak SOAP, CORBA, REST, and a lot of other acronyms.